Chances are, if you’re here, you are a personal friend who I’ve made one of these for or you’re a sewist who wants to see how I made it and maybe make one yourself. Whoever is here reading this, I’m glad you’re here. These take a lot of time and patience, but they are worth it. 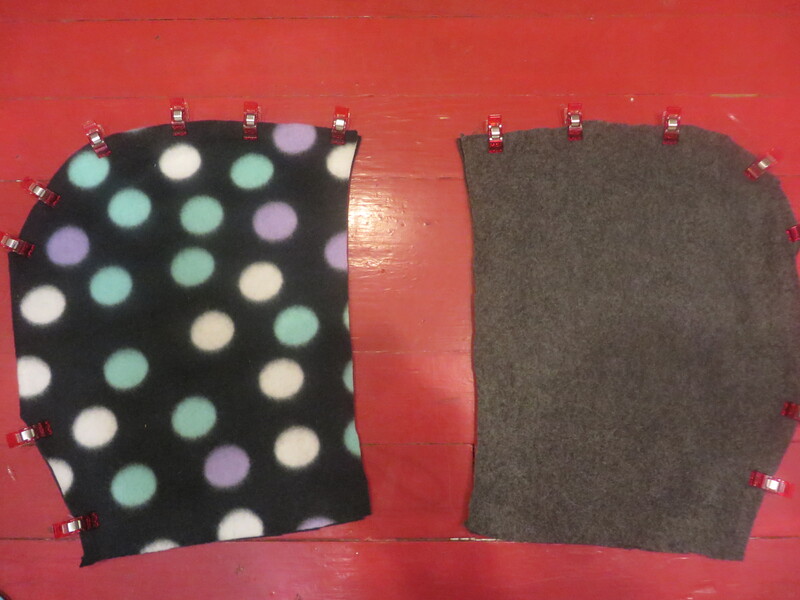 Many car seat ponchos that you see are quick and easy to make. 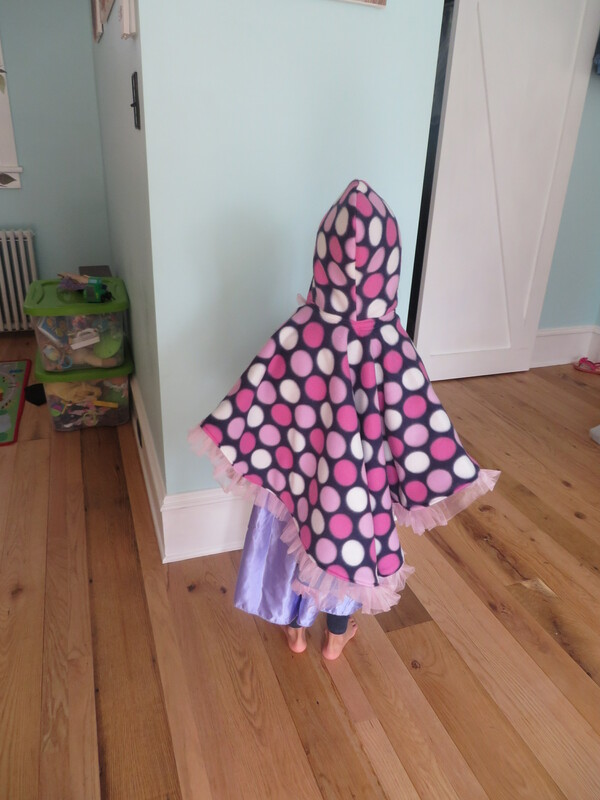 The addition of tulle edging that I use in my ponchos for girls is tedious and very time-consuming. But, seriously, I think it really shows in the end result that the crafter took the time and effort to make it over-the-top! That’s what I’m going for. 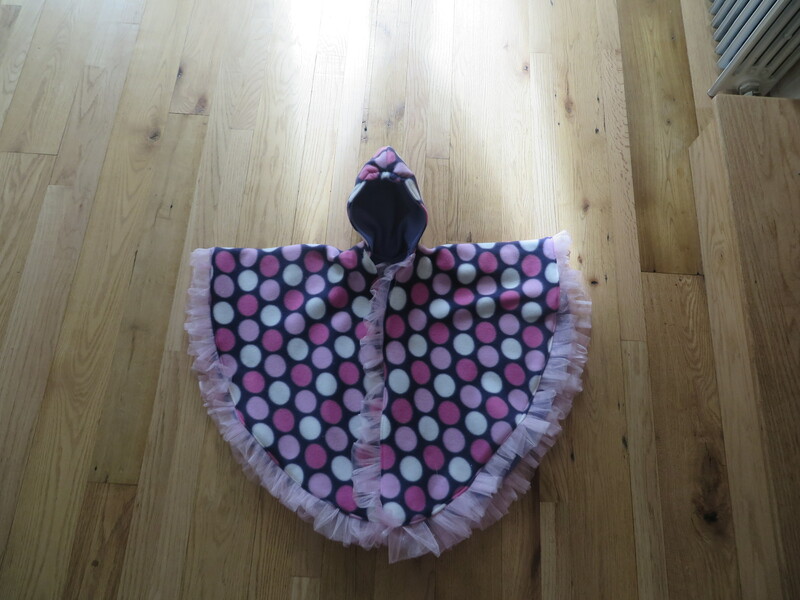 One friend of mine in particular received a polka dot w/ pink tulle poncho (will show picture in this tutorial) for her daughter’s third birthday. This was the first one I had ever made, and I spent hours on it trying to make it just right. They still get compliments on it and tell me how much they like it. That is the reason that I sew and give in a nutshell! The only thing better than giving something that you have made from scratch is getting that great feedback from the receiver. It makes me feel good and motivates me to keep creating! So enough of me ranting about how sewing gets me all emotional. We need to dive into this before one of my kids wakes up and throws a wrench in my plans of completing this write-up today! Convertible Car Seat Poncho (with snap sleeves). 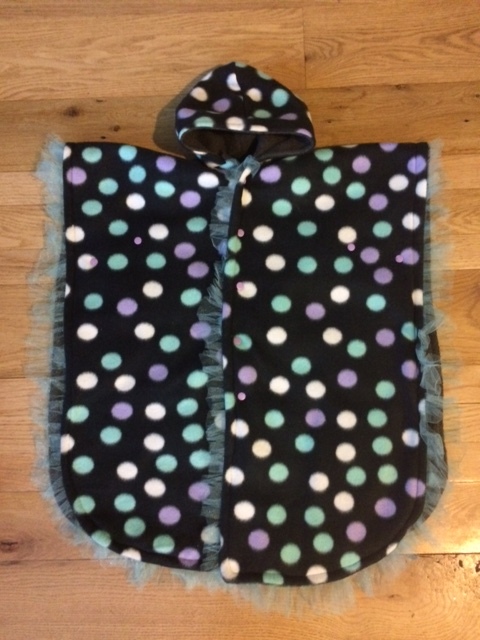 Basic circular car seat poncho with tulle. This is the one that was gifted to a friend, and it sits so nice with this shape. It was created by eye and has two snaps (or three, I can’t remember) for the closure. This tutorial will work for whatever shape you’re going for, so not to worry. I will give rough ideas for how I made the convertible one, and you can choose what parts of that poncho you like and use them if you wish. Of course, first we have to get the material together. 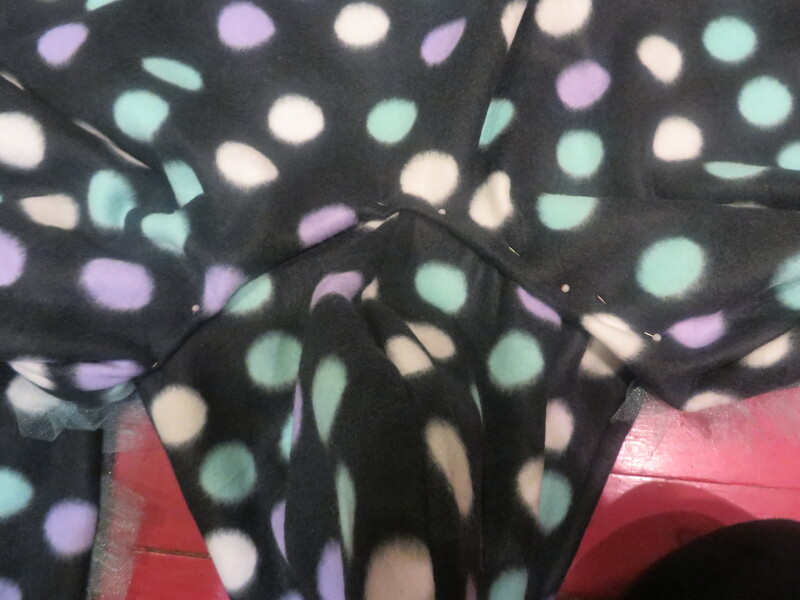 So to recap, I just take my fleece and fold it in half, w/ the fold on top. 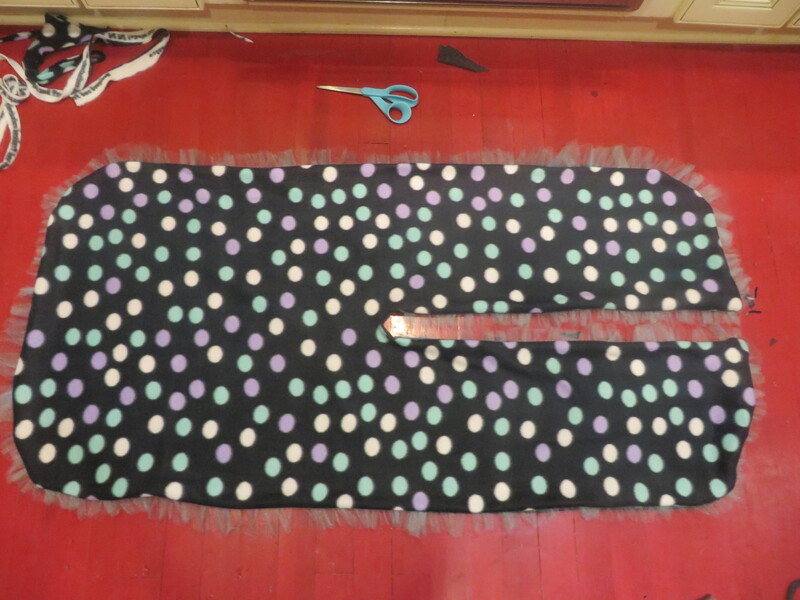 (I make sure the stretch is horizontal before I cut my fabric.) 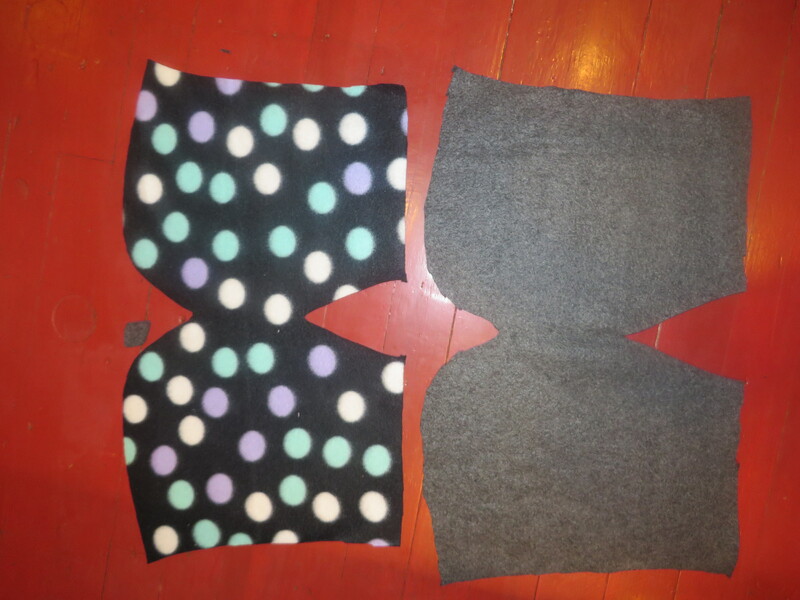 Now fold in half long-ways. 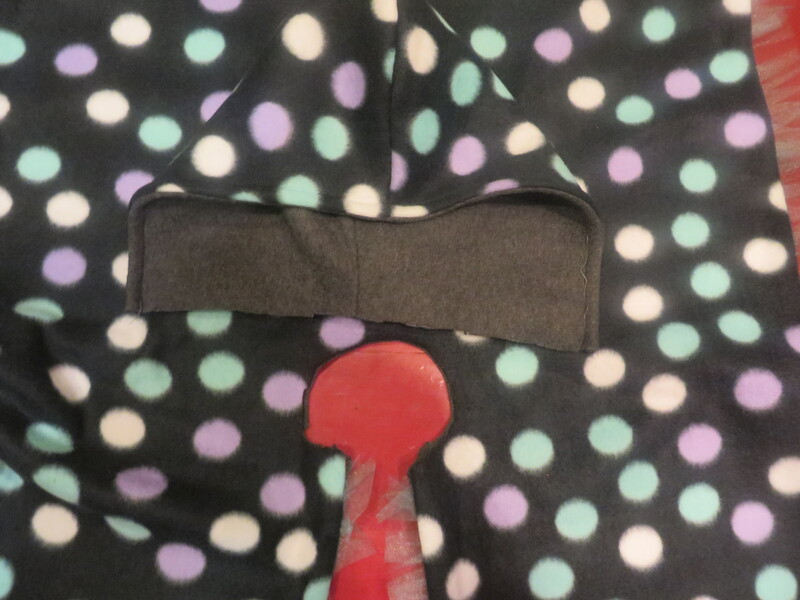 Snip off corner to mark the center of your poncho where you will attach the hood. 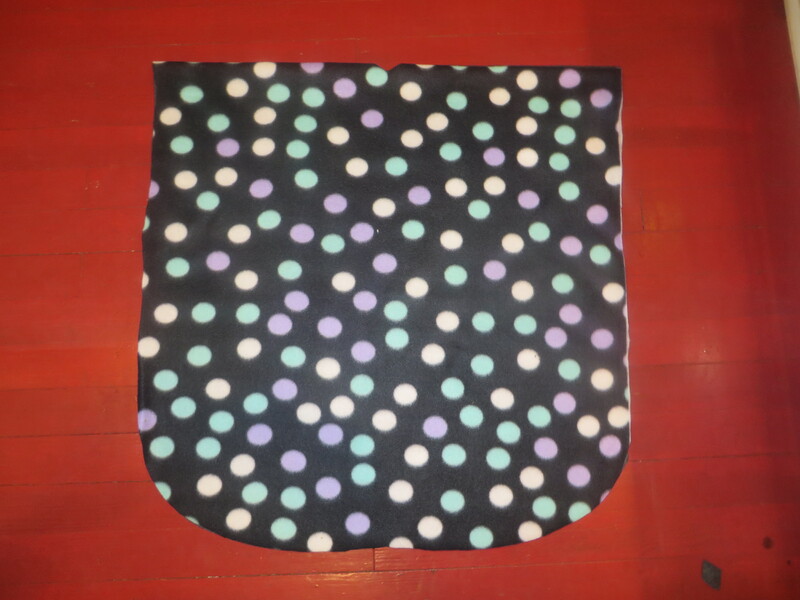 Now you have the basic shape of your poncho when you unfold it. 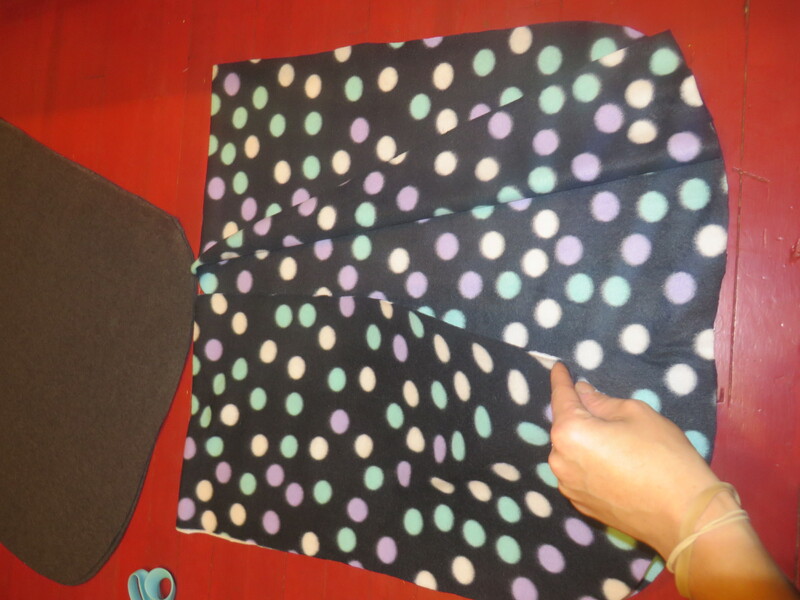 Now repeat this process to create this piece from your solid fabric. You guessed it! 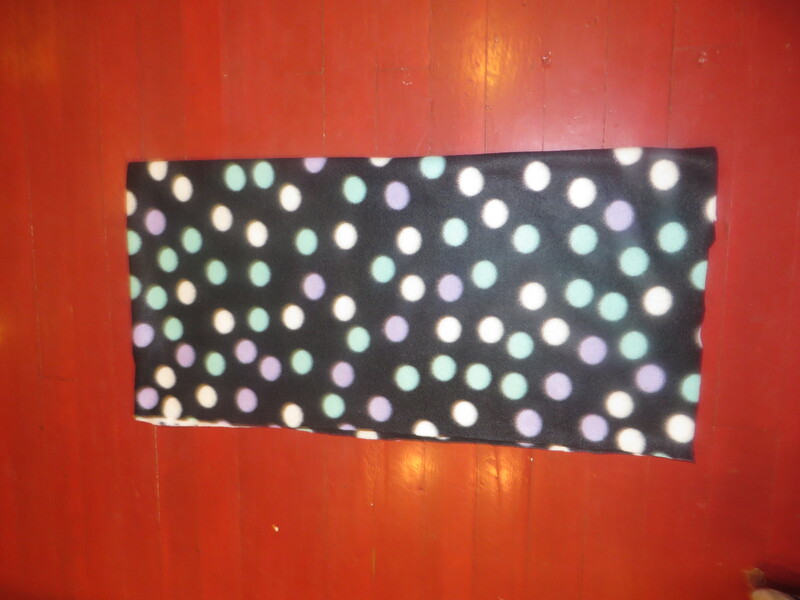 I just lay this one over my solid fabric, making sure the stretch is running horizontal, and cut. Take the shortcuts where you can get them! Tracing hood from a favorite sweater. 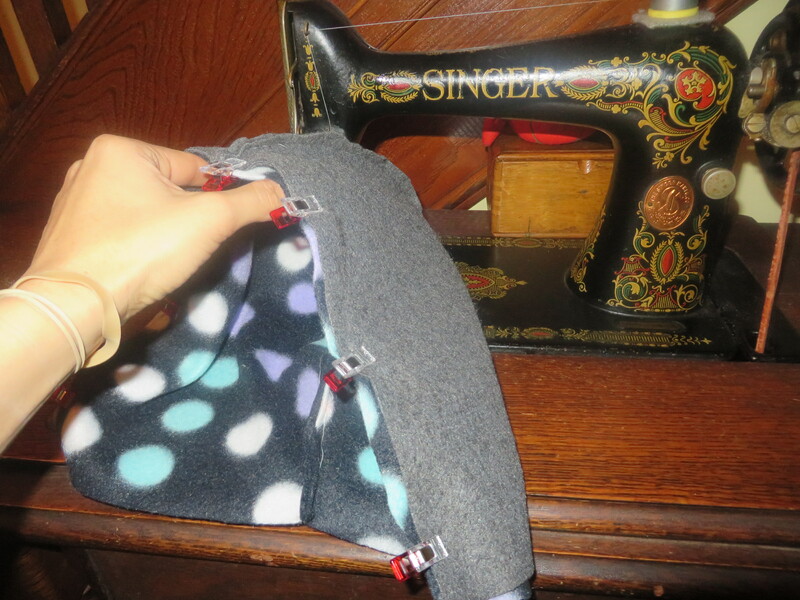 Now take one of your hood pieces and pin or clip it right sides together, being sure to leave the front piece, which sits closest to your face when wearing, open. Also, do not sew the neck hole closed! Hood cuts turned right-sides together and clipped. 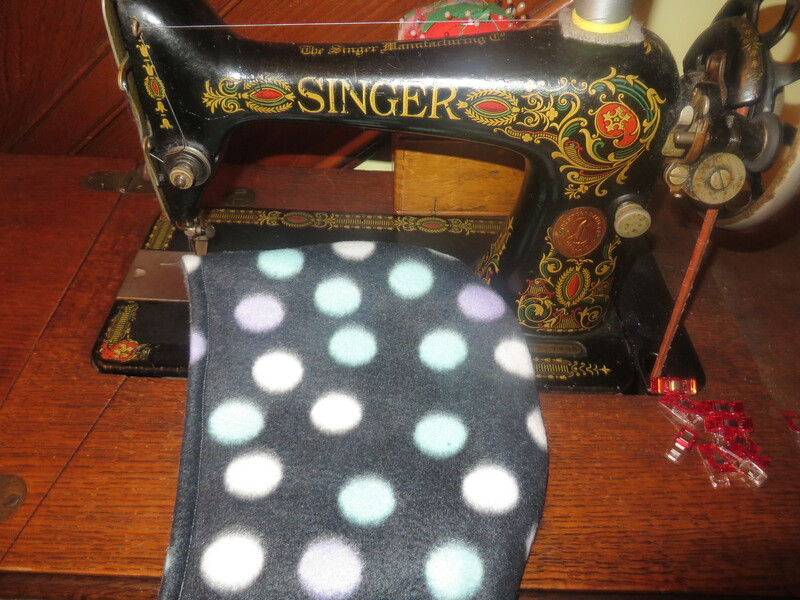 Repeat this for your solid fleece. Once you have both hoods complete, lay one inside the other, making sure they are right sides together. 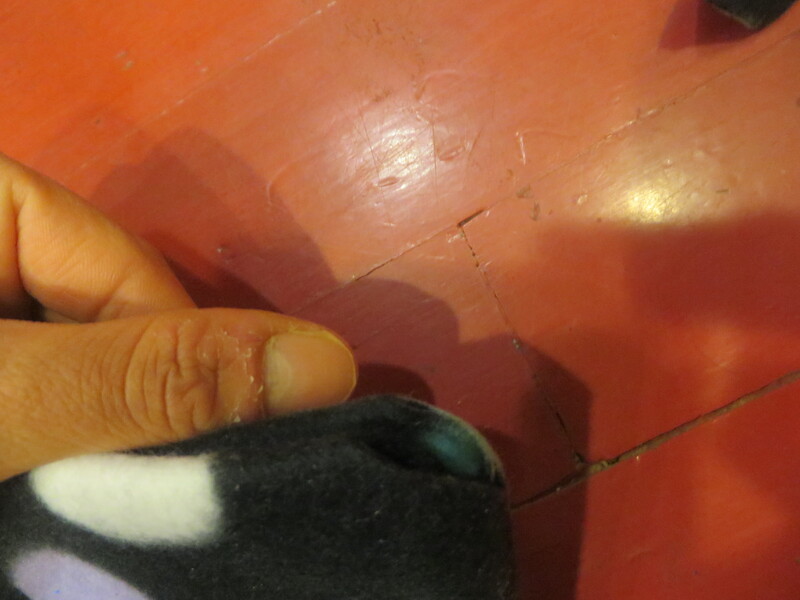 Line up your seam in the middle of the hoods to make sure they are as close to perfect as possible. Two hoods clipped right sides together. 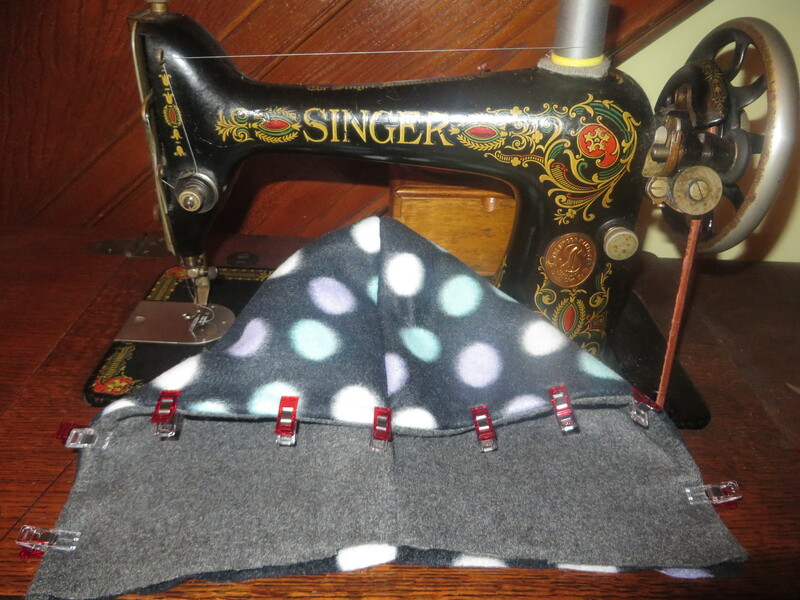 Sew where you have clipped, along the front of the hood. Turn that right-side out and lay one hood inside the other. Pin and get ready to top-stitch. Hoods pinned and ready to top-stitch. And the hood is done! Let’s get back to that poncho. You now have two pieces of fabric, one solid, one printed, cut into the same shape for your poncho. Next, you can cut up from the middle of your front piece of the poncho to meet the little nick you made to mark your hood placement. Sorry in advance for sideways photo. 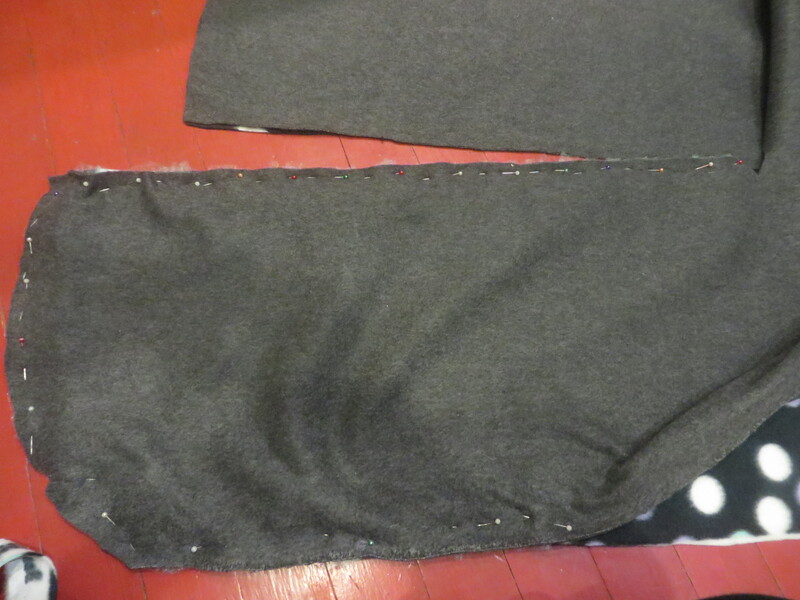 Make a slit from bottom front center of your cape to the little nick you cut to mark hood placement. 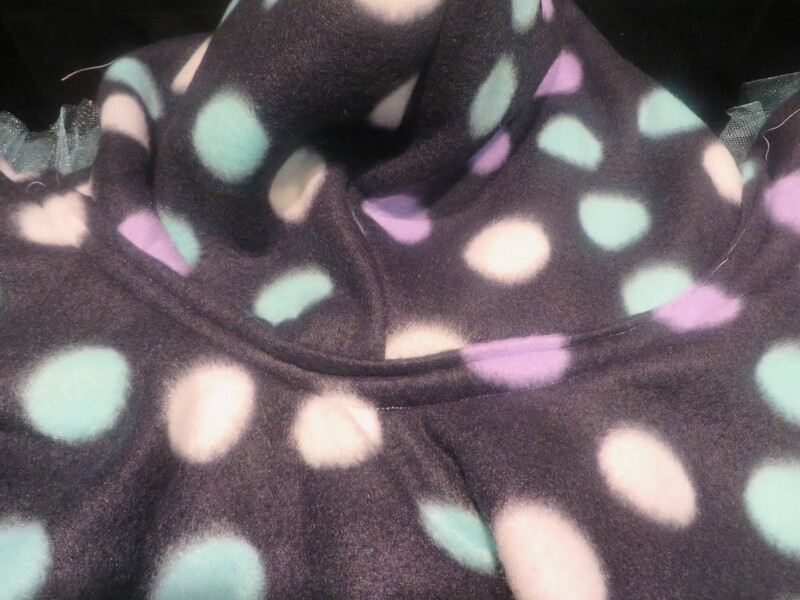 Repeat this step for solid fleece. 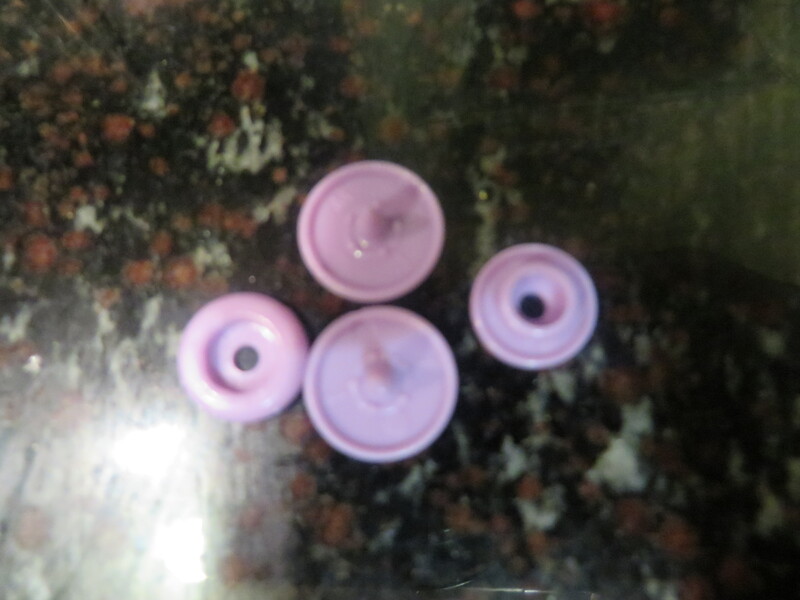 Lay them on top of one another, right sides together, and make sure they are as close to same shape as possible. Looks like this. Now get that yard of tulle of yours. Get ready to cut your tulle strips. Now we are ready to cut our tulle strips. 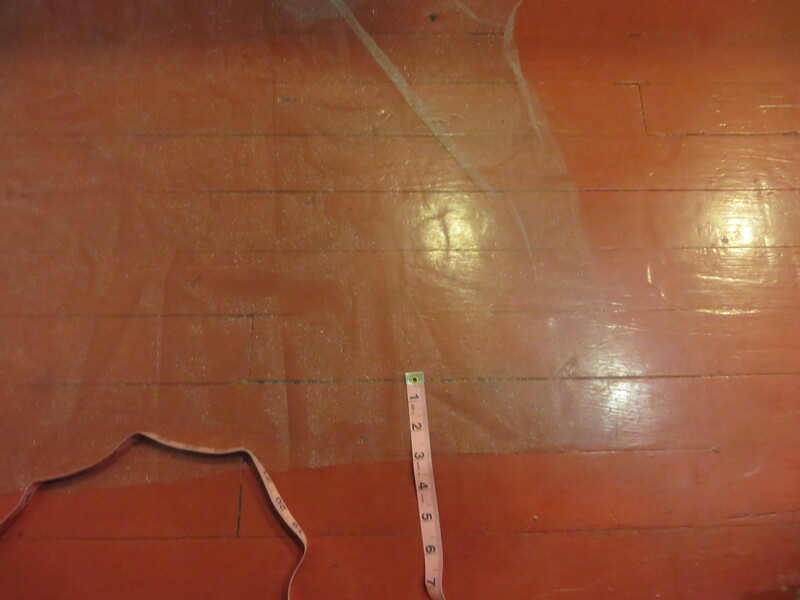 I’m so math-savvy that I use my floor to decide measurements and maintain semi-straight lines! Of course, all the lines are crooked in my 100-year-old house! I won’t hold it against you if you want to use a ruler here! 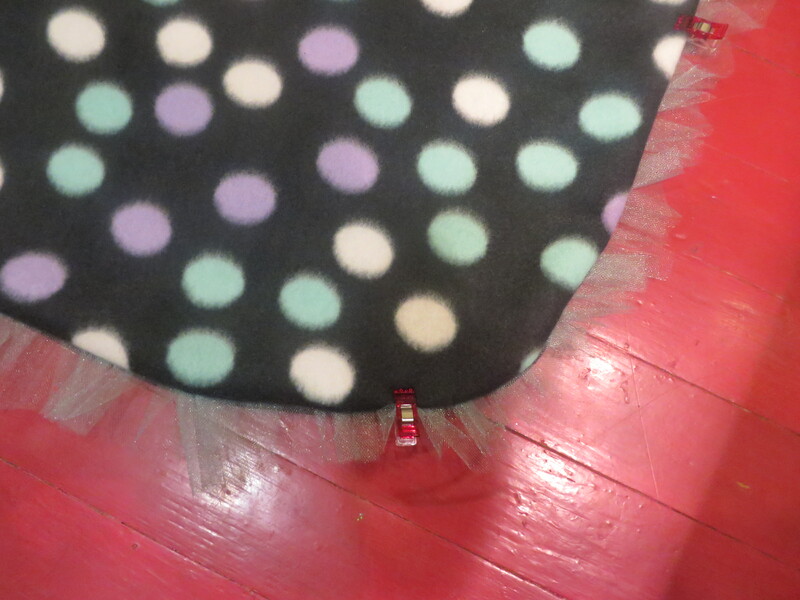 So I basically cut my tulle strips to the height of my floor slats. Let’s say three inches. I just cut the whole yard of tulle I had (and used all of it) into these three-ish inch pieces. And here comes the tedious part that makes all the difference in your finished product! 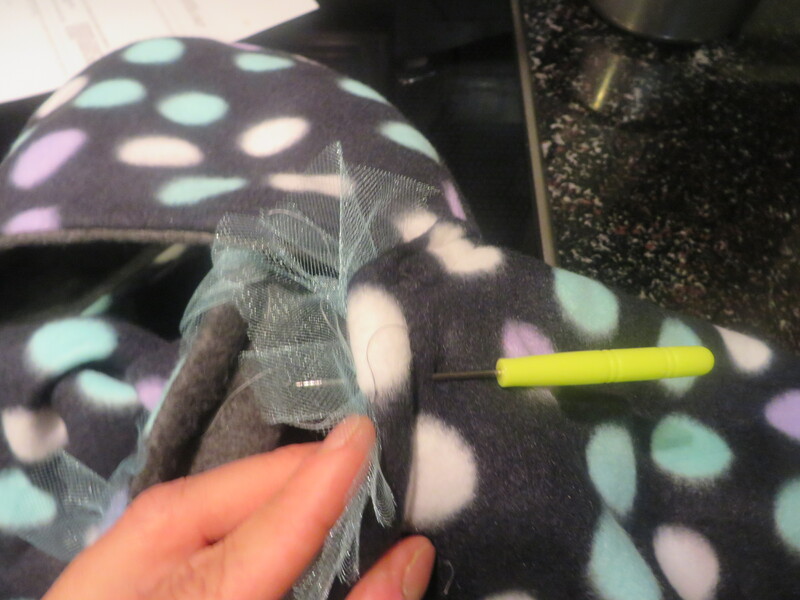 You want to stuff your tulle in between the two layers of your fleece, making sure the end of the tulle is flush with your fleece. Let’s get a picture of this before it gets confusing. 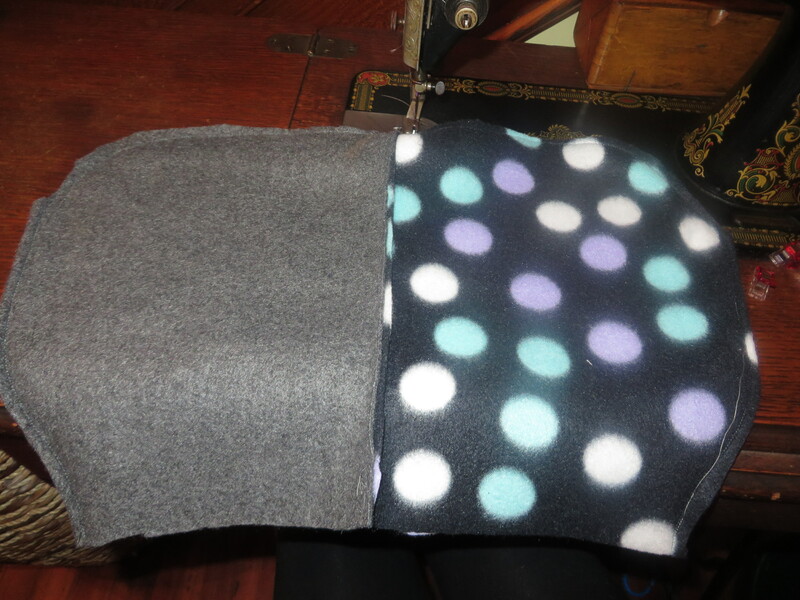 Tulle sandwiched and scrunched in between right-sides together fleece. When stuffing your tulle in between your layers of fleece, you also want to generously bunch or scrunch your tulle to get the right look. Pin or clip super often! Tulle can be slippery and challenging! Keep scrunching and pinning and clipping all the way around until you make it to your neck hole! And keep on pinning and clipping and scrunching and bunching! It will be worth it, I promise! 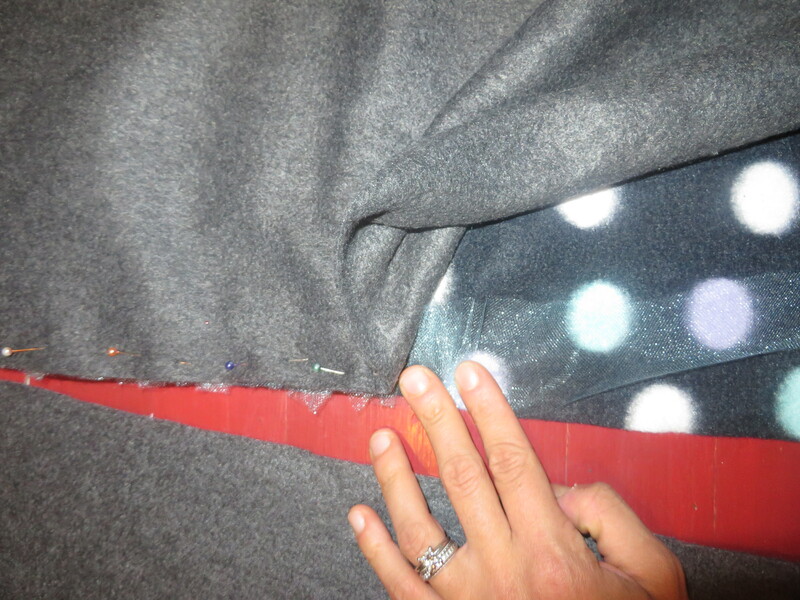 Once you get it all pinned, sew as close to your edge as possible. Turn right-side out. Looking good! Poncho turned right-side out. Look at that bunched-up tulle! Worth all the time and effort, right?! And now it’s time for that pesky hood. This is the trickiest part of making this, I would say! We need to lengthen the line of our opening to accommodate our hood. I like to make a kind of half- or three-quarter circle line. I just manipulate the hood into a circle and cut a circle that’s pretty close. Half-circle opening enlarged to accommodate hood. Now we need to stuff the hood inside that hole and make it look good. Difficult, but not impossible! 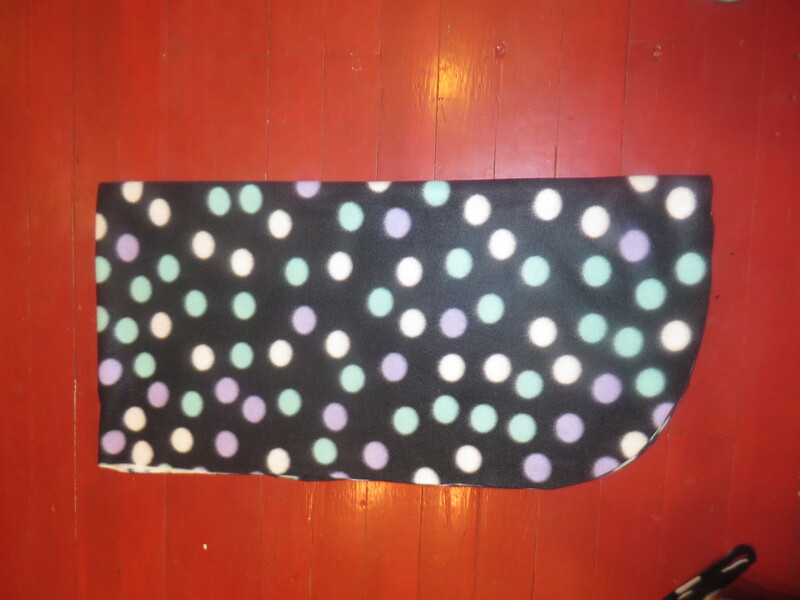 Starting at one end of hood, tuck it into the body of the poncho, making sure that the fleece on the body of the poncho is rolled in so that you have a nice, finished look at the base of the hood. 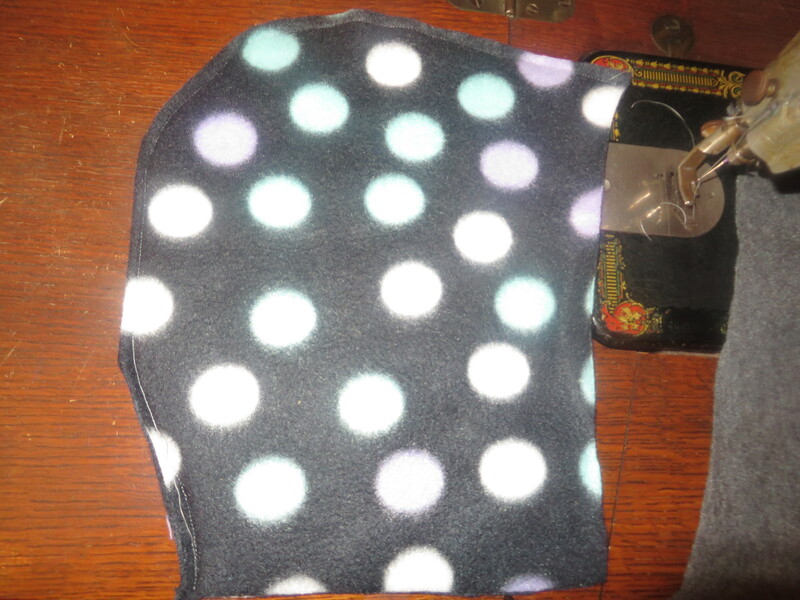 Watch that inside fleece fabric! It likes to roll out if you don’t pin exactly right. Hood stuffed in hole and pinned. Now you can go back and pin and top-stitch the body of the poncho, securing the tulle in place even more and giving an overall more professional look. And now for the snaps! Surprise, surprise – I just do the closures by eye. I like three-inch spacing between snaps. I go right down the center. Using your awl that comes with your snap pliers, pierce a hole in your fabric where you’d like your snap to go. Using awl to install snaps. Snap components for one working snap. Continue this down the front center as you like. On some ponchos, I do one or two. For this one, I think I did six total as it’s what I call a “convertible.” We’ll get to that in a second. You are done! Well, you might be?! Remember I just mentioned the “convertible” aspect to this particular poncho? Well, I was experimenting with a way to keep these short sleeves as sleeves. A.S. vehemently argued against this. And then I came up with a compromise. Actually, it’s the perfect compromise, I think. I decided to make snaps to form the shape of a sleeve and hold this poncho in place more like a light jacket. Let me show you a picture so it makes better sense. Boy, it’s really busy with those polka dots and difficult to see! If you look really closely, you can see two snaps on either side of the poncho that make kimono-style sleeves. I had A.S. try it on and then just marked where I thought they should go on one side. 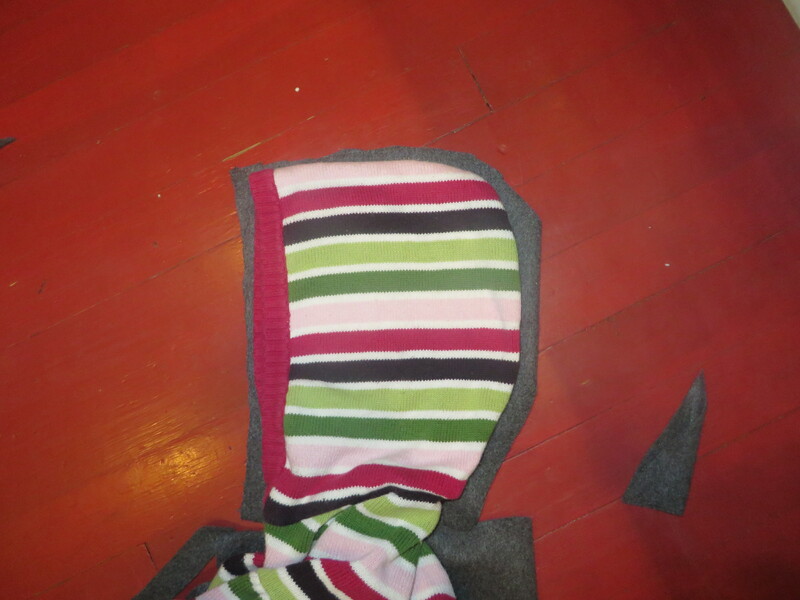 Then I folded the poncho in half to get it as close to symmetrical as possible on the other side. We use these all the time! You can leave the kimono-style sleeve snaps snapped and then it’s just a pull on jacket. Or you can just not use them and use one or two of the snaps on the front closure so it’s a cape. Versatile product, isn’t it?! And now you’re really, really done. How did it turn out? I’d love to see a picture of it in the comments below! 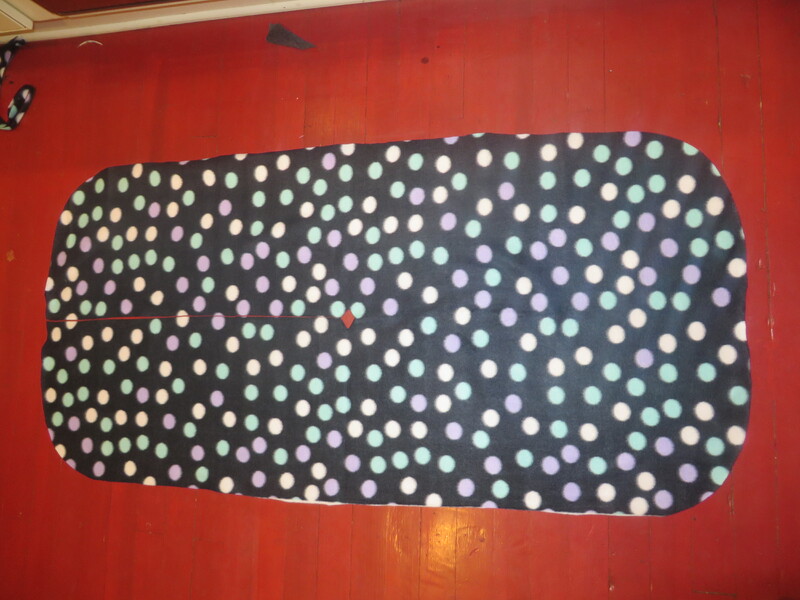 I’m always looking for fabric combo suggestions/ideas, and I have many more potential recipients of this cool cape!